5 THINGS TO REMEMBER AFTER GRADUATION! – TEACHER TIP FROM MISS GELAUDE. Save contact numbers of people you can call if you have a question. Seize every opportunity! Take each and every client you can. Rebook as many clients as you can. Stay organized! Write down everything in your planner. Reward yourself! Save up for an item or a vacation you’ve always dreamed of. 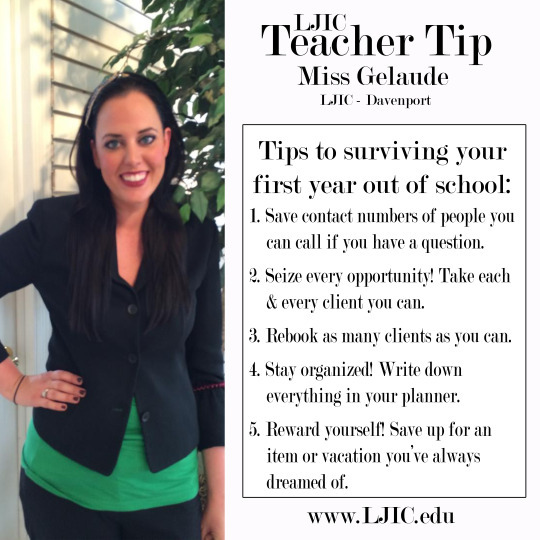 Thanks Miss Gelaude for sharing your great tips & for participating in today’s #LjicTeacherTip! Are you interested in learning more about La’ James International College and the programs offered? Contact a LJIC Career Planner today! Call 888.880.2108 or visit www.LJIC.edu.